Let’s talk about the science behind a very popular pregnancy herbal supplement – Raspberry Leaf Tea. Though I proudly bought my Prenatal Vitamins, Ovulation tests, and pregnancy pee sticks, I hid my “Mother to Be” tea underneath a red pepper on the supermarket conveyor belt the other day. Yes, I bought the tea but I am still conflicted about buying into the concept that a tea can magically (uh, I mean biologically) strengthen a uterus. Alright then, challenge accepted! Time to dig up some scientific evidence for these claims. So, can raspberry leaf tea do all these amazing things the internet claims it can: strengthen the uterus, shorten labor, decrease assisted delivery, and so on? Well, despite this supplement being a fan favorite over in the midwife community (63% of American midwives recommend this supplement to stimulate labor ), overall it seems like the jury is still out as to its pro’s and con’s. A very comprehensive scientific literature search by Holst et al. in 2009  found only six studies testing the effects of the tea in a lab, with non-human or petri dish subjects, and only five studies that took place in the clinic. I do want to note that the small number of studies unveiled was not for lack of trying – these authors including an obscure paper from 1941 that only included three women! Anyway, the lab studies were mixed. Overall, raspberry leaf tea was shown to facilitate more rhythmic contractions in uterine tissue but also showed conflicted toning and relaxing effects. The five clinical studies did not reveal any strong effects of the elixir (positive or negative) in humans. Some studies did show a shorter first or second stage of labor but the tea only knocked off a few minutes (wow!) and one study showed shorter gestation length… but only by a couple of days (insert more sarcastic enthusiasm). 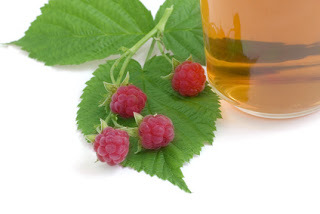 After Holst and colleagues published their efforts combing the literature, another lab study  was conducted to directly test uterine contractions in the presence of raspberry leaf tea in vitro (outside the body). When applied directly to uterine tissue from non-pregnant rats, raspberry leaf tea had no effect on uterine contractibility. However, when the researchers stuck a pregnant rat’s uterus in a petri dish with some the tea – BAM! – the cellular response rivaled that of Oxytocin. Oxytocin, among the many wonderful things it can do during birth, is the main hormone in charge of making sure the uterus steps up and does its job to help get baby out into the world. The researchers then tested whether raspberry leaf tea played Oxytocin’s little helper in this process. With only six test subjects, however, they found results split in two directions: half of the test subjects showed that oxytocin-induced contractions were augmented with raspberry leaf tea, but the other half showed the same augmentation followed by inhibition of contractions. Hmmmm. At the end of the day, though, the authors did not even want to put weight into their own findings (which I actually found quite promising so I was a bit bummed). They concluded that since humans are unlikely to get the same dose that they used on their rat uteri, this effect is probably not translatable to the intact, in vivo uterus of your average pregnant women. Now for the potential adverse effects. Well, fortunately, there were mostly no adverse effects noted. However, there was one study that found odd trans-generational effects . That’s right, drinking raspberry leaf tea while pregnant may affect your baby and your baby’s baby. In this study, mother rats were fed raspberry leaf extract every day from conception to weaning. The babies of these mother rats showed signs of early puberty and the babies’ babies showed greater growth restriction. Important to point out, though, these rats were consuming raspberry leaf extract throughout the entire pregnancy. I cannot put a percentage on the number of female humans consuming the tea throughout pregnancy but I am guessing more women are taking it primarily when they start to hit that “holy crap, I have to push out a screaming child!” stage. My unscientific analysis of pregnant friends puts this stage somewhere between the second and third trimester but rarely during the first, when the developing womb baby is most likely to be affected by what we are putting into our bodies and when these effects may affect the womb baby’s egg babies. Of course, more studies are needed before we can conclude that this is or is not a scary potential result of raspberry leaf consumption. Sorry, internet, but I have to side with the scientist buzzkills, Holst and colleagues, when they state – “The fact that the product has been in traditional use for decades does not constitute evidence”. There simply are not enough studies to back up the claims that raspberry leaf tea is a pregnancy super juice. With that said, in honor of full disclosure, I must admit that I have a steaming pot of “Mother to Be Tea” sitting next to me as I write this. Yup, there will always be a tiny part of me swayed by the fact that it worked for somebody’s sister’s sister. 1. McFarlin, B. L., M. H. Gibson, et al. (1999). “A national survey of herbal preparation use by nurse-midwives for labor stimulation: Review of the literature and recommendations for practice.” Journal of Nurse-Midwifery 44(3): 205-216. 2. Holst, L., S. Haavik, et al. (2009). “Raspberry leaf – Should it be recommended to pregnant women?” Complementary Therapies in Clinical Practice 15(4): 204-208. 3. Zheng, J., M. J. Pistilli, et al. (2010). “The Effects of Commercial Preparations of Red Raspberry Leaf on the Contractility of the Rat’s Uterus In Vitro.” Reproductive Sciences 17(5): 494-501. 4. Johnson, J. R., E. Makaji, et al. (2009). “Effect of Maternal Raspberry Leaf Consumption in Rats on Pregnancy Outcome and the Fertility of the Female Offspring.” Reproductive Sciences 16(6): 605-609. I have fertility issues. I can conceive but we do not make it past 6-8 weeks. I had stumbled upon the Rasberry leaf tea and decided to try it. It did not have any magically powers with me. But I will say that it lengthened my menstral cycles and eased cramps and symptoms. So as for me I do not feel that it is a help for fertility but anyone with horrible periods could probably benefit. To your previous commenter. You may highly consider being checked for antiphospholipid. Which is over coagulation in the blood. Which, when you become pregnant, little baby signals to your body to not over clot and allow him/her to attach. However, a person with antiphospholipid, their body does not get that signal and over clots cutting off any blood flow to the baby. I currently am taking one baby asprin a day and we are expecting!!! Nearing the end of my first trimester. Depending on how bad the clotting is, a person may need greater forms of meds to keep the body from over coagulating and cutting off blood flow to the baby. Anyhoo, look it up! Ask your doctor about it. It is hard to loose baby after baby. Oh, I also did another program that I believe helped me in more than just getting pregnant. If you’re interested in that leave a reply or if you can contact me directly do that. Thanks for sharing your literature review! I used RRL tea with my first 2 pregnancies when I was younger and had relatively short, easy labors. Coincidence? Probably. :). Pregnant again and I will probably drink it again. I actually like the taste when it’s iced. I’m a little concerned about the epigenetic effects, but my son is huge. That counts for something right? Also, I have to wonder if there is a powerful beneficial psychological placebo effect from many women joining together to drink the safe RRLT as a comfort before they deliver. Just knowing that these women are all supporting each other as they face the uncertainties of labor may provide a collective calming effect that leads to relaxation and then a more efficient labor. It is unlikely that any scientific test could prove this since it falls in the spiritual and psychological realm. We do know that the mind has a powerful impact on the body from books like “The Mindbody Prescription: Healing the Body, Healing the Pain” by John E. Sarno, M.D. I just came across this post and blog. I too have numerous friends who believe in raspberry leaf tea, and I was all for trying it – why not? But, my doctor actually told me not to drink it because she’s afraid it can start labor. I have heard of women drinking lots and lots of it, in high concentrations, when they are overdue and want the baby out. However, I always assumed that the dose was important, and that drinking say 1 cup a day at normal strength would, at worst, do nothing. I didn’t challenge the doctor because I care that much about drinking it. But I thought it was an interesting response.